Sonos could soon have a rival. 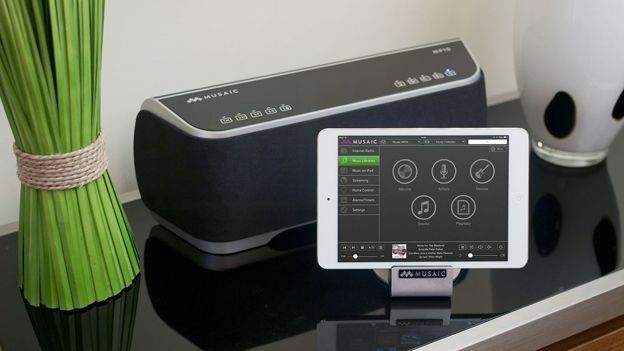 London-based start-up Musaic is a wireless home music system that promises audiophile-quality sounds. And it's already raised £10,000 in its first day on Kickstarter. Musaic consists of two Music Players – the MP5 and MP10. Using standard Wi-Fi, they stream tunes from almost any device, be it an iPhone, iPad, Android smartphone or tablet, PC, or Mac. You can stream over 20,000 internet radio stations, and you can get tracks from streaming services like Napster, Rhapsody, TuneIn, and others. Of course, you can stream tunes from your networked hard drive and DLNA device, too. You can also beam tracks to both speakers over Bluetooth. Both the MP5 and MP10 are built from top class components and designed by experts with decades of experience in hi-fi. The digital signal path they use doesn't compress tracks, so even 24-bit recordings can be played at their full resolution. Musaic can also play nice with your automated home. So you can dim the lights and play your bedtime song of choice at the same time. Smooth. And thanks to new smart home tech called AllJoyn, Musaic will be able to communicate with products from big-name brands like LG and Panasonic. Like Sonos, you can listen to the same song in all rooms, or set up zones with different tracks in each. Perfect for a house party. Musaic is seeking £60,000 on Kickstarter to become a reality. Its campaign launched yesterday, and has already raised just shy of £10,000.